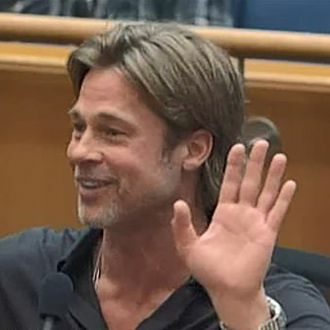 A Los Angeles official was faced with a difficult task on Tuesday: She had to ask sculptor Brad Pitt to stop talking. Pitt was among many people (including Diane Keaton) to voice their support for new building plans at Los Angeles County Museum of Art. On Tuesday, Pitt appeared before the L.A. Board of Supervisors to urge them to vote in favor of funding for the plans. While the effort was ultimately successful — the designs by Swiss architect Peter Zumthor were approved in an unanimous vote — Pitt’s argument in support of the building plans went on too long, much to Chairwoman Janice Hahn’s apparent chagrin. “It brings me great pain to say wrap it up, Mr. Pitt,” Hahn said as his time expired, interrupting the actor as if she were awards-show music cutting off an acceptance speech. The room burst into laughter. “It kills me to say that, but wrap it up,” she added.